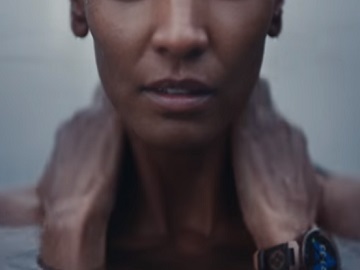 Louis Vuitton invites people to discover its latest Tambour Horizon Connected Watch Collection a new campaign. The 60-second film features Sophie Turner, Justin Theroux, Urassaya Sperbund, Liu Haoran, and Liya Kebede and provokes viewers to think about themselves as part of this world and decide if they are explorers. “Here and now. I live to move. I trace my path to the beat of the horizon. We move in orbit. In a landscape of time. Through the constant that is change. I’m connected to all, to the magnificent. I’m an explorer. Are you?” British actress Sophie Turner (known for her role as Sansa Stark on the HBO’s hit series Game of Thrones) says in voiceover, while on screen the other house ambassadors are seen. The Connected Watch Collection includes the Connected Watch Tambour Horizon Monogram Eclipse 42 ($2,550), the Connected Watch Tambour Horizon Monogram Brown 42 ($3,000), Connected Watch Tambour Horizon Matte Black 42 ($3,085), the Connected Watch Tambour Horizon Pure White 42 ($4,450), as well as a battery charger for these watches (priced at $130), and several models of earphones (retailing at $995), including black monogram earphones, red monogram earphones, white monogram earphones and stripes earphones.